Have you ever heard of a foeder? Chances are you haven’t. Especially if you aren’t the nerdiest of craft beer nerds. Foeders are specialized brewing vessels that are used in a relatively small number of breweries across the United States. They originated in Europe, where they were primarily used to make wine before crossing over to the brewing industry. Foeders are essentially giant wooden barrels that support the fermentation and conditioning of beer. Their construction allows beer to breathe, so to speak, with oxygen slowly entering the vessel through pores in the wood. This is the perfect environment for beers that are purposely soured with bacteria. Even when fermented clean, without funk-producing bacteria, the resulting beer is unique. It generally picks up the character of the foeder’s wood planks. Perhaps the most famous brewery using foeders is New Belgium Brewing Co. in Fort Collins, Colorado, which makes some of the world’s most outstanding sour beers. New Belgium has more than 60 of these vessels housed in what it calls the “foeder forest.” If you’ve ever had La Folie or Le Terroir you know the magic that can result from this method of brewing. 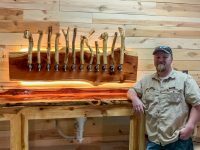 Hawk Moth Brewery & Beer Parlor in Rogers recently announced the acquisition of its own foeder, which is the first in Northwest Arkansas and only the second in the state (Lost Forty Brewing Co. in Little Rock owns the other). “Maybe we’ll build a foeder forest of our own here in Arkansas,” said Hawk Moth owner and brewmaster Bradley Riggs. 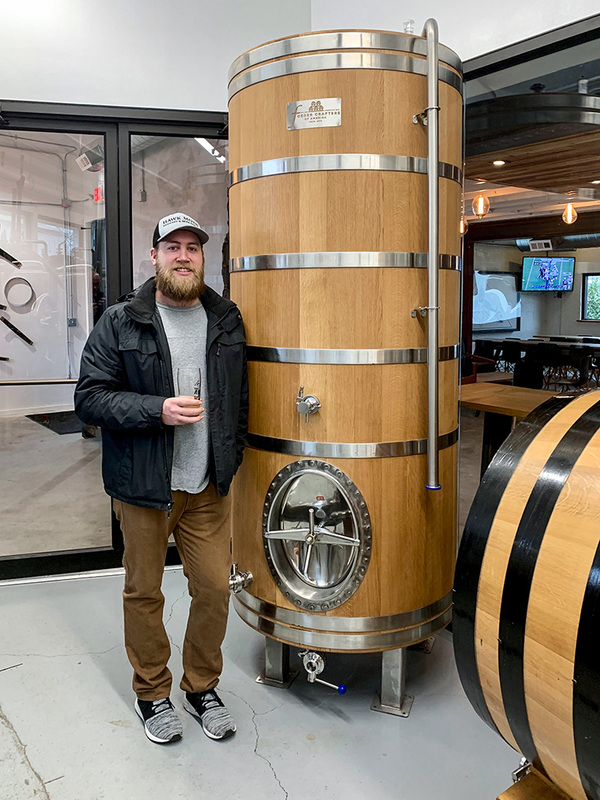 Riggs recently took possession of a custom nine-barrel white oak foeder manufactured by Foeder Crafters of America in St. Louis, Missouri. Riggs said the concept for his foeder is to brew an oak-aged stout year-round. As beer is pulled out and sold he’ll top the foeder off with fresh beer — a method known as solera brewing. Currently there is a Russian imperial stout conditioning inside the new foeder. Riggs said he anticipates the beer will be ready by late Spring and will finish somewhere around 10% ABV. 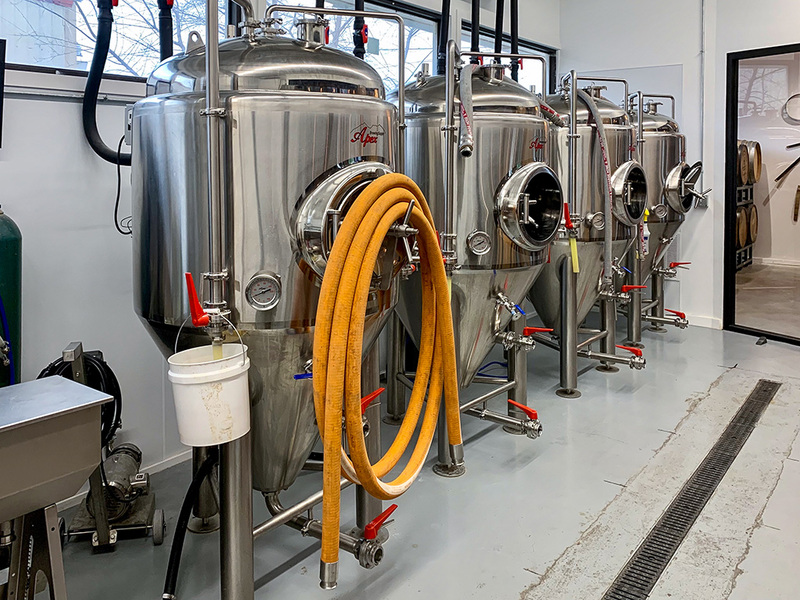 Hawk Moth has been open for a little more than four months now, and according to Riggs, things are going gangbusters at the east Rogers brewery. The brewery has hosted a number of barrel-aged beer releases and other special occasions like beer dinners and glassware parties. Many of these events have required tickets in order to attend. Ticketed events are fairly new to the Northwest Arkansas beer scene, but according to Riggs, the region’s beer drinkers have been very receptive to the idea. Hawk Moth constantly rotates its beer, though the one that’s always on tap is a 4.3% French-style table beer called The Interurban. It is a lightly-hopped wheat beer that sports 35 IBUs. Despite its year-round availability, The Interurban is not the brewery’s best seller. Hawk Moth’s IPA is constructed with what Riggs describes as a west coast grain bill with an east coast hop schedule. Known as The Hoppy Tap, the beer utilizes a different combination of hops each time it’s brewed. Batch #5 showcases Centennial and Citra hops and weighs in at 7.2% ABV. “It turns over every three weekends or so, which means it’s always fresh,” said Riggs. 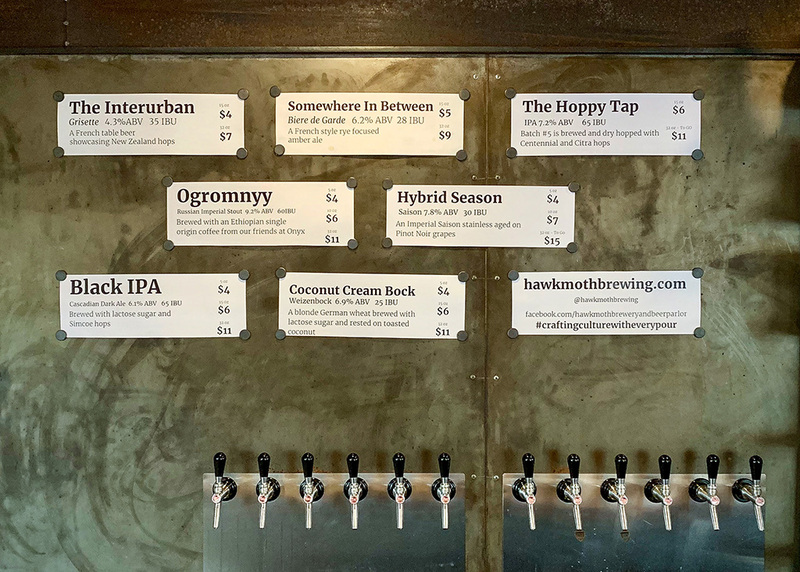 Hawk Moth is a small brewery with a small staff, and distribution is mostly limited to draft and crowler sales in the taproom. Bottled beer is also available from time-to-time. According to Riggs, the newly-acquired foeder may lead to more bottled offerings in the future. Look for Hawk Moth at Frost Fest in Fayetteville on Feb. 2. The brewery will have four or five beers on hand, including one that won’t be released in the tap room until the following weekend. And don’t forget to visit the brewery this coming spring, when Northwest Arkansas will get its first taste of locally-produced foeder beer.